Note: The 10/22 protest has been postponed due to weather. It will be 10/29 8-11am, same place, before the Ringling Circus Protest which is at Blue Cross Arena at 11:30am. People will still be going to Hetties at noon 10/22. Join us this Thursday October 6th from 9:00-11:00 and Saturday October 22nd from 9:00-12:00. 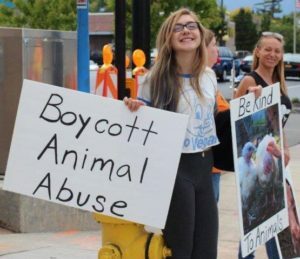 We will meet at the Railroad St. entrance of the Public Market to protest the use of animals for food.We will also leaflet to inform the public about the power of veganism. We have plenty of signs, something for everyone. Leaflets provided. Come for the whole event or stop by and stay as long as you like. Lunch at Hetties there to follow (Public Market near the Union St entrance). Thanks to Mary for organizing these events! Check out our Facebook page for ongoing buzz about it.